What Does the P0110 Code Mean? The P0110 code is generated when the powertrain control module (PCM) detects a circuit malfunction with the intake air temperature sensor. The IAT (intake air temperature) sensor works like a thermistor and measures the air temperature by determining the air resistance. Usually, the IAT sensor is found in the intake air duct but in some vehicles, it can be found in the intake manifold. 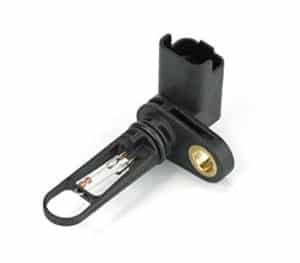 The IAT sensor supplies important information to the PCM through which it controls things such as the air/fuel ratio, ignition spark timing, and other similar characteristics. It is generally a two wire sensor with a 5V reference wire from PCM and a ground wire. The resistance of the sensor varies as air passes over it and this variation in the resistance affects the 5 Volt supply to the sensor. If the air is cold, the resistance increases and a higher voltage signal is generated. Whereas, if the air is warm, the air resistance lowers and a low voltage signal is produced. The powertrain control module (PCM) monitors this change in resistance and if it detects a variation which is out of the normal operating range, the P0110 trouble code is generated. How to Diagnose the P0110 Code? The first step you should take before starting the diagnostic process is connecting a car battery charger. When working on the trouble codes, your car’s ignition is usually on and this can cause the car’s battery to discharge. Low battery voltage can result in other trouble codes to generate which will make the situation even worse. Thus it is best to connect the car battery charger.
. This device is used for self-diagnostic and reporting and comes in two types; regular code reader and an advanced scan tool. With an OBD2 scanner, you can easily read the error generated by P0110 code and use the built-in features to record data as well. Inspect the wiring and connections around the IAT sensor. Notice if the wiring is too close to a high voltage component which may be causing a problem. The poor electrical ground also causes a problem. Using an OBD2 scanner, scan the IAT sensor and verify if it has a 5 volts input. If the reading is fluctuating or is not close to 5 Volts, then the IAT sensor needs replacement. Once you have verified that the 5 Volts input signal does not exist, check the reference voltage at the back of the PCM connector. If the 5 volts is present there but not at the IAT sensor, then repair the open in the signal wire. Reset the OBD2 scanner and your car for a test drive then check whether the code disappears or not. If the problem persists, check the voltage at IAT sensor which is 5 volts and inspect wiring and connections as well. Disconnect all the connections and reconnect them to reset the settings. After resetting, notice if the voltage on IAT output increases to 5V as the temperature of the engine reaches its optimal level. If the IAT sensor seems to be working fine, your problem is fixed. Otherwise, replace the MAP sensor and check again. If the problem still continues, there is a possibility that the problem is with the PCM. Before starting the procedure, remove the negative terminal of the battery so that it disconnects. Removing the battery is important to protect against an electric shock. The IAT sensor is located on the left side of the intake manifold while the MAF sensor can be found on top of the filter box. Spray the electric cleaner thoroughly and rub gently on both sides of the sensor to remove any dust and dirt. After cleaning, leave the sensors to dry for a while. After the sensors are completely dry, install them back and connect the battery’s negative terminal. Should I Repair the P0110 Trouble Code Right Away? Yes! The P0110 trouble code should be fixed immediately as it can cause performance issues and if the problem is ignored for too long, the engine may suffer damage as well. Moreover, a faulty IAT sensor also decreases the fuel mileage and creates a problem with acceleration as well. If the above-mentioned solutions did not help fix your problem, provide us the details in the comment below and we will surely get back to your with a desirable action plan.